Turkey will support the residents of Syria’s Al-Bab to ensure their safe return and the normalization of daily life, the head of the Turkish General Staff said on Friday. 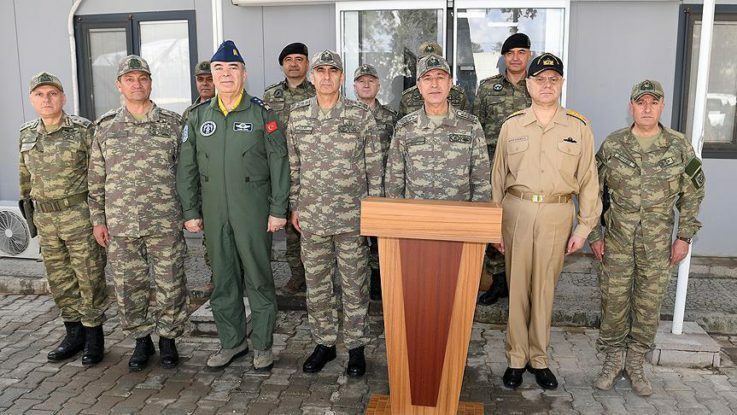 Hulusi Akar made his remarks during his visit to the command base of operations of Turkey’s Operation Euphrates Shield in the southeastern Kilis province. “After we seized Al-Bab, we reached the goals we set at the beginning of the operation,” Akar said. “All kinds of support will be given [to the Al-Bab residents] to help normalize life in the city and [ensure that ] the residents safely return to their homes,” he added. Akar recalled that in the first phase of the operation, in which Jarabulus, Al-Rai, Dabiq and Suran areas had been cleared of terrorists, residents had been able to return to their homes with Turkey’s aid. Speaking to reporters in Turkey’s southern Antalya province on Friday, Cavusoglu said Turkey now hoped the new U.S. administration would keep the promises made by the previous one. “We had said to our American friends ‘Keep your promises’ and they said ‘After the end of Manbij operation, YPG [fighters] will retreat to the east of Euphrates River’,” Cavusoglu recalled. “That was what the previous administration promised us. They did not keep their promises,” said Cavusoglu, adding Turkey now hoped the new administration would clear Manbij of YPG terrorists. Turkey and the U.S. designate the PKK a terrorist group, but Washington has resisted doing so with the YPG, saying the organization is a reliable partner in the anti-Daesh fight. The Turkish military had said earlier on Friday that the Turkish-backed Free Syrian Army forces had taken control of all neighborhoods in Syria’s Al-Bab. A total of 230 residential areas and 1,925 square kilometers (743 square miles) of land were liberated from the Daesh terror group in northern Syria since the onset last August of the Turkey-backed military operation in the region, the Turkish Chief of General Staff had said in a statement. Operation Euphrates Shield aims to provide security, support U.S.-led coalition forces and eliminate the terrorist presence along Syria’s northern border with Turkey. The operation, which began on Aug. 24, relies heavily on Free Syrian Army fighters backed by Turkish artillery and air support.